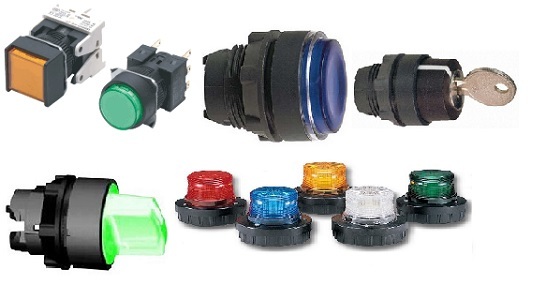 Push Buttons & Signaling Devices include a large variety of options used for start and stop controls as well as hand, off, auto as well as toggle and momentary switches. There is also indication lighting included in the pushbutton or as separate indication light, horn, beacon, strobe and many other options. Push Buttons are used to start or stop an action frequently used in industrial applications. They are also commonly used in control panels. Push buttons usually come in 22 mm and 30 mm sizes and pushbutton enclosures have the holes sized for these pushbuttons. There are non-illuminated push buttons for simple on/off actions and illuminated push buttons for indication along with the action. Selector Switches normally come in 2 positions or 3 position options and have the same 20 mm and 30mm sizes. Label tags are sold separately for on/off, start, stop, up, down, hand/off/auto, and custom labels for desired operations. They are sold with key or lever operation and other options like metal or plastic or normally open and normally closed configurations. Indication comes in both visual indication and audible indication devices. For visual indication there are lights of assorted colors, beacons, strobes, flashing lights, and more. For audible indication there are horns and alarms. Indication is used the indicate status or to give warnings like alarms or emergency conditions.